It was an idea whose time had come. In three short years, it grew from nothing into one of the largest businesses of its kind in the world, worth over three billion dollars. Sixteen months later it was bankrupt, a worthless shell of its former self. 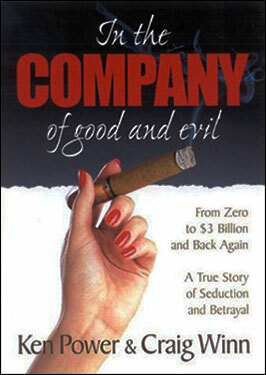 In the Company of Good and Evil is the amazing true story of Value America. Who built it into the Internet’s second largest e-tailer? Why did it grow so quickly? More importantly, what ultimately caused the greatest calamity in corporate history? The answers, and their implications, go well beyond the story of a single firm. They shed light on both the entrepreneurial spirit that builds reality out of dreams, and the self-serving ambitions that threaten to destroy the very fabric of our society. The authors are insiders. They founded the company, nurtured it, helped it grow, gave it wings—and then watched it die a very painful, very public death. Power and Winn chronicle the brash self-confidence and remarkable coincidences that shaped Value America. They also examine the methods and motivations of those who brought the company to its knees. Flashes of inspiration capping months of grueling work, games of “chicken” won and lost, blackmail schemes, white knights, dire corporate poverty, and billion-dollar IPOs are all part of the drama. Prepare to meet some of the most powerful people in America, in technology and politics, in business and labor, in finance and faith. They all left their fingerprints on The Company. The hero of our story is the Company itself, the brainchild of Craig Winn. His experience and vision led him to re-invent an industry that was clearly broken. But Winn didn’t build Value America by himself. In the Company of Good and Evil follows the fortunes of the firm’s five founders: Craig, the visionary entrepreneur; Rex Scatena, the friendly attorney; Bill Hunt, the merchandiser; Ken Power, the designer; and Joe Page, the techno-wizard. These five formed the core of a team that nearly changed the world, if only for one brief moment. These events actually happened. If our story reads like a novel, perhaps it is because truth is more exciting than fiction.